Philippine troops battling militants in a central province killed a key Abu Sayyaf commander who had been blamed for the beheadings of two Canadians and a German hostage and was apparently attempting another kidnapping mission, the military chief said Wednesday. Military chief of staff Gen. Eduardo Ano told The Associated Press that troops have recovered and identified the remains of Moammar Askali, who used the nom de guerre Abu Rami, in the scene of the battle in a far-flung coastal village on Bohol island, where five other Abu Sayyaf gunmen were killed in the fighting Tuesday, along with four soldiers and policemen. Ano said troops took the picture of Askali after his death and that captured Abu Sayyaf militants identified the young militant leader. "This is a major blow to the Abu Sayyaf," Ano told The AP. "If they have further plans to kidnap innocent people somewhere, they will now have to think twice." The military chief said Askali had led several of militants who traveled by speedboats from their jungle lairs in southern Sulu province to Bohol province in an apparent bid to carry out another kidnapping in a region that is popular for its beach resorts and wildlife. Sporadic gunbattles between the remaining Abu Sayyaf militants and government forces continued Wednesday, military officials said. At least 10 people has been killed since Tuesday in the fighting in Bohol, far from the extremists' southern jungle bases and in a region where the U.S. government has warned that the gunmen may be plotting kidnappings, officials said. Military officials said at least six gunmen, three soldiers and a policeman had died in the ongoing gunbattle in a village in the coastal town of Inabanga. The island province lies near Cebu province, a bustling commercial and tourism hub. National police chief Director General Ronald dela Rosa said troops and policemen attacked the gunmen early Tuesday in Inabanga, where the gunmen had arrived aboard three boats. The gunmen took cover in three houses as the firefight broke out. 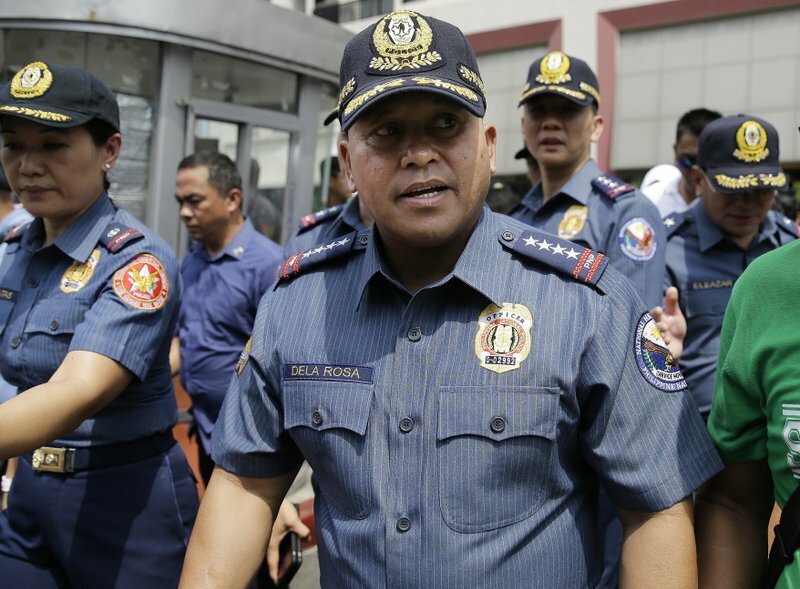 Government forces seized control of two of the houses, and the rest of the gunmen either were in the third house or had fled the area, dela Rosa told reporters. It's the Abu Sayyaf's first known attempt to carry out ransom kidnappings deep in the heartland of the central Philippines, far from its jungle lairs in the southern provinces of Sulu and Basilan. Bohol island, where one of the world's smallest primates, called tarsiers, are found, drawing many tourists, lies about 640 kilometers (397 miles) southeast of Manila. Bohol is about an hour away by boat from Cebu province, across the busy Cebu Strait, which is crisscrossed daily by ferries, cargo ships and fishing vessels. Abu Sayyaf militants have crossed the sea border with Malaysia on powerful speedboats and kidnapped scores of foreign tourists in past years. In 2001, they sailed as far as western Palawan province, where they seized 20 people, including three Americans, from a resort. "If we were not able to monitor this and engage them with our government forces, it's a cause for alarm if they were able to carry out kidnappings," dela Rosa said. Ano said military intelligence operatives had been trying to track down the movements of the suspected militants, who first traveled from Sulu to southern Zamboanga peninsula. Intelligence later indicated the gunmen landed ashore in Inabanga, prompting military and police officials to deploy their forces, he said. The gunmen traveled on board motor boats along a river to Inabanga's Napo village, where government forces assaulted them, military spokesman Col. Edgard Arevalo said, adding that troops recovered four rifles and a homemade bomb from the slain gunmen. The U.S. Embassy in Manila recently advised Americans to take precautions amid "unsubstantiated yet credible information" of possible kidnappings by terrorists in Bohol, nearby Cebu province and other central areas. The United States and the Philippines have separately blacklisted the Abu Sayyaf as a terrorist organization for bombings, kidnappings for ransom and beheadings. Some Abu Sayyaf commanders have pledged allegiance to the Islamic State group. Philippine President Rodrigo Duterte has ordered troops to destroy the extremists in Sulu and in outlying island provinces, and has threatened to declare martial law in the country's south if the threat posed by the Abu Sayyaf and other extremist groups aligned with the Islamic State group gets out of control. Although the Abu Sayyaf militants have been weakened by years of battle setbacks, they came back to international attention when they separately beheaded two Canadians last year and a German hostage earlier this year after ransom deadlines lapsed. The militants are still holding at least 29 captives in Sulu's jungles, many of them foreign tugboat and cargo ship crewmen seized at the sea border between the southern Philippines, Malaysia and Indonesia.